Can You Mix Formula With Breastmilk In the Same Bottle? 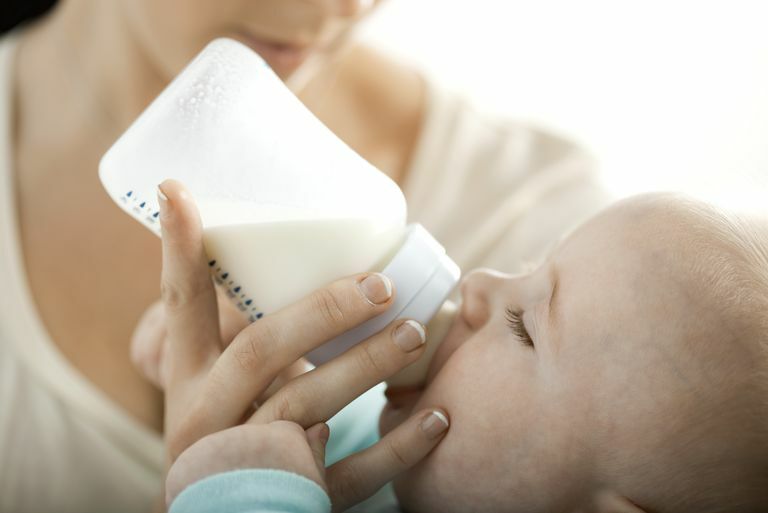 Can You Mix Breast Milk and Infant Formula in the Same Bottle? Breastfeeding moms supplement their children with infant formula for many reasons. If you do decide to supplement with formula, there are a few things you should consider before you mix formula with breast milk. Mixing the two is possible, even in the same bottle, but you need to be careful to follow the mixing instructions before combining formula with breast milk. Improper mixing can lead to an over-concentration of nutrients that may pose a danger to your baby. Low milk supply: Some moms may struggle to make enough breast milk to breastfeed exclusively. Supplementing with formula ensures that your baby gets the nutrition he needs while still getting some breast milk. Extra sleep: Feeding pumped breast milk and formula is one way to allow the mother to get some extra sleep. This way, the other parent can take a turn feeding the baby in the night, giving the mother a chance to rest. Returning to work: Many others choose a combination of breast milk feeding and formula feeding for convenience when they return to work. Whatever the reason may be, if you decide to give your child breast milk and formula, there may be times when the two need to be combined in the same bottle. Infant formula is made to provide your baby with a specific amount of calories and nutrients in a specific volume of fluid. For example, a standard formula is 20 calories per fluid ounce. So, if you prepare the formula as directed, your baby gets the expected amount. However, if you add powdered formula or concentrated liquid formula directly into your breast milk before you dilute it with water, it changes the balance of nutrients and water in both your breast milk and the infant formula. When your baby is an infant, his kidneys are not yet mature. The kidneys of newborns and young infants need enough water to process all of the nutrients in their feedings, especially the proteins and the salts. When a feeding is too concentrated, it can be dangerous and just too much for your baby's little body to handle. Therefore, when preparing your child's formula, you should always use the correct amount of water and follow all the instructions that you are given. When you buy formula for your baby, you will usually get one of these three types: concentrated liquid, powdered, or ready-to-feed. If you use concentrated liquid formula or powdered infant formula, be sure to make it according to the manufacturer's instructions or any alternate instructions that your baby's doctor gives you. Mix the formula first, separate from the breast milk. Concentrated and powdered infant formulas are typically diluted with sterile water or safe drinking water that has been boiled for five minutes and then cooled. Depending on the quality of the water in your area and your baby's health, you may be able to use tap water. Talk to your child's doctor to find out if tap water is a safe alternative. Once the concentrated liquid or powdered formula is prepared, it can then be added to a bottle of breast milk or given after the bottle of breast milk. You should NEVER add undiluted powdered infant formula or concentrated liquid formula directly into your breast milk, and you should NEVER use your breast milk in place of water to mix concentrated or powdered infant formula. If you have any questions or concerns about how to dilute or mix your baby's formula correctly, call your baby's doctor. In contrast, if you decide to add your breast milk into a bottle of ready-to-feed formula, that is OK. This type of formula does not pose the same concerns as those that need to be prepared. While it is OK to mix your breast milk with an already prepared infant formula in the same bottle, there are some good reasons to offer each one at a time (if possible) that are worth considering as well. You don't want to waste your breast milk: If you offer your breast milk first, your baby will get all of it (perhaps later rejecting a little bit of formula because she's too full), ensuring you don't waste the little bit of milk you have to provide. Your baby will get all the benefits of breast milk: Since breast milk contains more nutritional and health properties than formula, it is best if your baby gets all of the breast milk that's available. Breastfeeding is one of those things where the best-laid plans often don't pan out. Whether you breastfeed, formula feed, or use a combination of the two (and whether or not where you end up is where you intended to be when you started), remember that making sure your baby is getting adequate nutrition is all that matters. As you find your way, just make sure that you do so safely. Perry, Shannon E., Marilyn J. Hockenberry, Deitra Leonard Lowdermilk, and David Wilson. Maternal Child Nursing Care. Elsevier Health Sciences. 2014.